and governments of Afghanistan and Pakistan closer to ensure success of the efforts for peace and the Afghan media in particular must contribute to this effect. Information, Broadcasting & National Heritage while talking to a delegation of Afghan media here today. She said that Pakistan attached great importance to its ties with Afghanistan as both the countries shared common history, culture and religion. posterity to ensure stability in the region so that the people inhabiting the region could live in peace and harmony. She said that Pakistan was committed to a broad-based and mutually beneficial relationship with Afghanistan and was ready to do all that it could to restore peace in Afghanistan because peaceful and stable Afghanistan was in the interest of Pakistan. neighborhood so that the nations in the region could achieve their common goals of eliminating poverty and ushering in an era of progress and prosperity for their citizens. expressed their resolve to help promote Â good relations between both the countries. 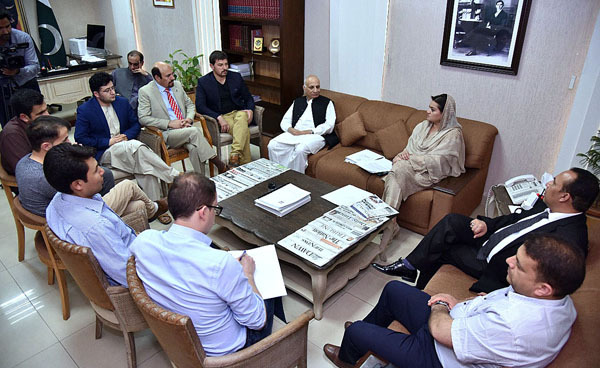 Minister of State said that Government of Pakistan would take all necessary measures to facilitate a meaningful interaction between the media of both countries so that greater understanding could be evolved through informed opinion. External Publicity Wing, MOIB and other officials from Ministry.